The winds were forecast to be 18 knots out of the west -- a perfectly westerly heading of 270. The winds were forecast to increase with altitude, becoming more northwesterly with increasing altitude. The low altitude winds weren't forecast to be ideal. Normally, I like to see the winds at 300 to 315, but a due-west wind of 270 has given me good ridge soaring days in the past. These conditions seemed to be "good enough", but not ideal for ridge soaring. The winds were considerably strong, but the thermals were projected to be quite strong too. I expected the thermals to be able to maintain their shape and consistently climb to altitude, but there is certainly a risk of the winds shredding the thermal bubbles of rising air, making the thermals more like turbulence, and less like usable lift. The president of our flying club set out for an early launch, and came back within 20 minutes -- having discovered that there was no lift on the ridge. He reported winds at a less-than-ideal heading of 250. Generally, the Massanutten mountain range doesn't work when the winds are anything more southerly than 270 degrees. A few minutes later, I decided to give it a shot. 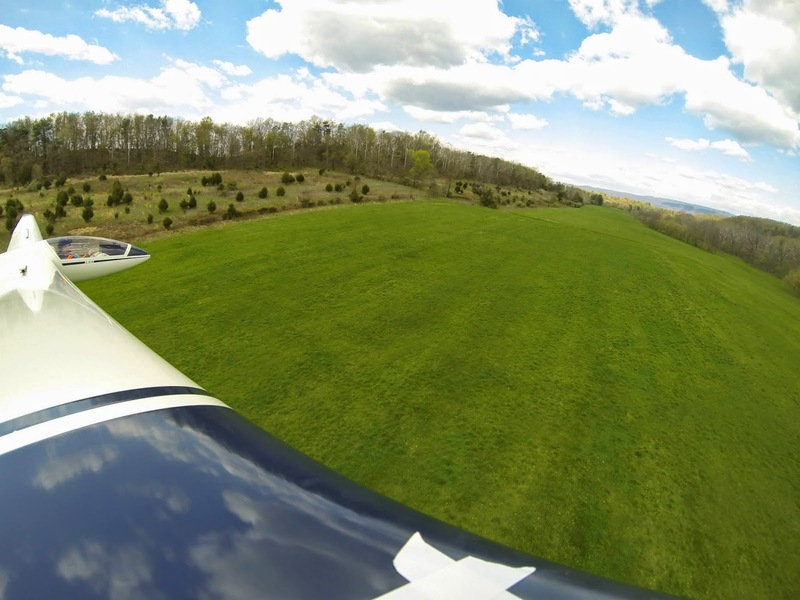 With my GoPro Hero 3 mounted to the right wingtip, I configured the camera to take a high resolution photo every 5 seconds. Immediately off tow, I found a very strong thermal to take me up to 800 feet above my release altitude. With the knowledge that the thermals are strong, and my flight computer telling me that the winds were now a much more favorable 293 degrees at 23 knots, I headed west toward the mountains to do some ridge soaring. Here's an image I made in Google Earth showing how strong the winds were. Each of those spirals indicate how much the winds were affecting the thermals. The rising columns of air were really getting blown horizontally. Normally, my flight trace looks like a bedspring, coiling almost straight up. I have done ridge soaring many times on this mountain range while the winds were not very favorable for the conditions. I've flown with weaker winds from 270, and been able to eek out a good ridge day. Today should be no different! Or so I thought. As I descended ever lower, I started trying to grab any piece of lift that I could get my hands on. Unfortunately, the turbulence was gusty enough that I couldn't slow down sufficiently to properly exploit what weak lift I could find. I had to maintain a comfortable speed (70 knots or so) to maintain controllability in the face of the biting gusts that were rocking me around. 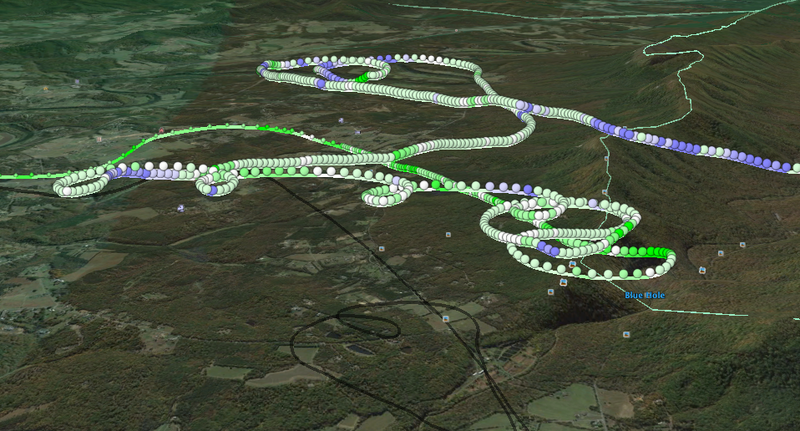 Theoretically, I could have slowed down the glider to a more efficient 50 knots and make better use of the weak lift. I didn't think it was worth the risk. At this point, I'm crossing back and forth on the ridge looking for a thermal to be kicked off the ridge, and also eyeing some of the landing fields below. 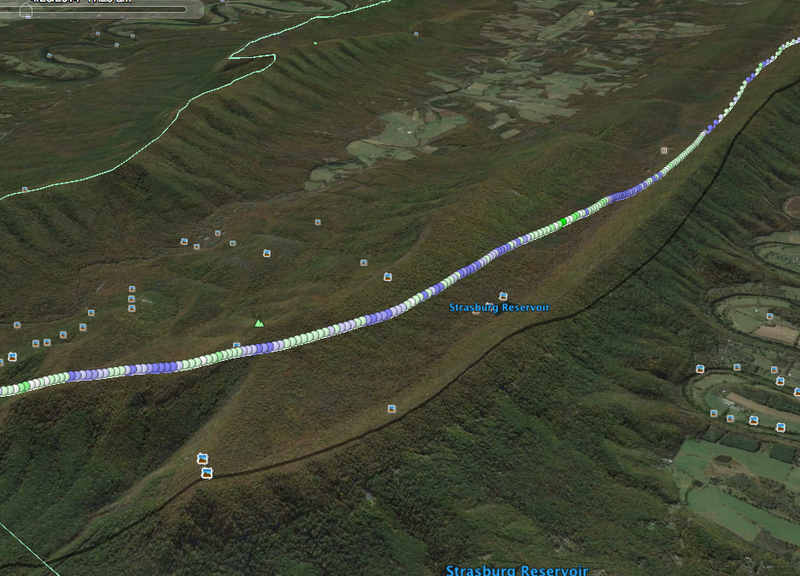 The left part of this trace is right around the hang glider launching point in Woodstock VA. I passed it 3 times, doing a turn-around at that point on the ridge. There were several people in the watch tower, who were clearly looking at me. I'm sure they noticed that each time I passed the watch tower, I was lower than the last time I passed by. On the final pass, I gave up, and headed to the field that I had been looking at on the last northerly trip. The Woodstock hang-glider launch area can be seen here. The road up to the top of the mountain has several switch-backs. The place where the hang-gliders launch can be seen just to the right of the last switch-back near the top of the mountain. I pulled the spoilers and did an abbreviated pattern (just a base and final leg) onto the longest, flattest, straightest field I could find. I was on the ground two minutes after I decided that this flight was going to end in that field "over there." Here you can see me taking the last turn onto my final approach, landing in the bright green field seen on the right of the photo. The field that I'm about to land on can be seen in the upper right of this picture. Altitude is about 300 feet above the ground. ... for what appears to be the smoothest golf-course-like grass that I've ever landed on. The longest, flattest field I could find looks pretty darn good from 100 feet on final approach. I did an uneventful touchdown and landing, with a pretty short roll-out. I breathed out a huge sigh of relief that it all turned out OK, and promptly started calling people back at the airport with my cell phone. 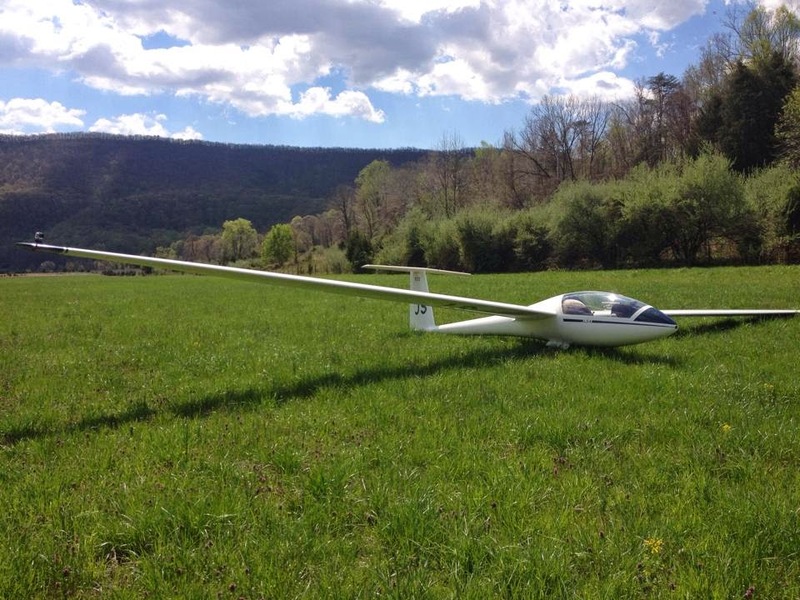 I informed the glider operations officer that I needed a crew to come and get me and my glider out of this field. Safely landed and parked in the field. The mountains I just came from can be seen in the distance. I secured the glider, made some phone calls, posted my land-out picture to Facebook, and found a crew. I walked along the gravel road just next to the glider, looking to find a way off of this property. A quick review of the map on my Google Maps application showed that it was a state park that I landed on, so I didn't have to worry about private land owners ventilating me with their shotguns. Instead, as I exited the state property, I noticed that there several derelict buildings, which appear to have been unoccupied and unmaintained for the last 20 years. There was a collapsed barn, collapsed house, and a collapsed structure that is hardly recognizable. Next to the house was a horse pen: gated, locked. There was a gate to the property, locked with three padlocks, set up in series. Any one padlock could release the chain and open the gate. If it wasn't so green, this kind of looked like a ghost town from the old west. I walked over a small bridge crossing the Shenandoah River, to the outskirts of Woodstock, VA, and made acquaintance with a local who was working on his yard. After a discussion about my emergency landing and the nature of the locked gate, they suggested that the Sheriff's office would probably have a key to the gate. I made the call to the local Sheriff's office, and within a few minutes, a deputy shows up. While discussing how we were going to get the glider off of the property, the deputy said, "I got a problem" Uh oh. "I don't have a key to that gate." Whew. The neighbors suggested that there might be a back way onto the property. I was pretty sure that there wasn't, since I had looked at the maps and satellite imagery pretty carefully on my phone. The deputy suggested I get in the back and we go explore for an alternate route onto the state park property. A few miles riding along in the back of the Sheriff's cruiser (and a purposely-vague Facebook post about being in the back of a police cruiser), the deputy got a call about a much more urgent issue -- some sort of domestic abuse that required his immediate attendance. I've seen enough episodes of COPS to know what that means! That means I have to get out of the cruiser. He drives back, drops me off at the park, and speeds off to his call. I'm still in the same position I was before I called the Sheriff's office. In the meantime, home-base has assembled a crew of two to come get me. They get in my Ford Escape (4x4), attach my trailer to the trailer hitch, eject my ElliptiGo from the trunk, and head out to get me. On the way, they get stuck in a traffic jam caused by an accident. Really, there's no rush. I decide to see if any of the owners of the property at the other end of the state park can be seen. I'm a little nervous about going up and knocking on their doors (for fear of the rural shotgun!). I run along the gravel road for a 1.25 miles. I look at the properties, and decided that I didn't want to get visited with a rural shotgun. These people live behind a locked gate and are probably easily startled. I'll take my chances with the gate. I run back. By the time I get back to the gate, my retrieval crew has arrived. They knew about the locked gate, and were prepared to hacksaw the last link in the chain to gain our freedom. (There was also a spare lock that would have been left in place to prevent the riff-raff from having newly-gained access to the field. Before we started hacking away, my retrieval crew and I surveyed the possibilities of finding another alternate route. We found an alternate route off-road. 'nuff said. There was no property damage as we got the Escape (in 4x4 mode!) with trailer in-tow onto the state park land. My retrieval crew helps me disassemble the glider, stow all the components in the trailer, and pack it up for the trip home. I made extra special care to ensure that the grass had no skid marks (the grass was in great shape). I also made sure that there was no trash left lying about. We leave the property through our newly-discovered detour, leaving hardly a trace of our path. The rest of the flying crew called it quits for the day. 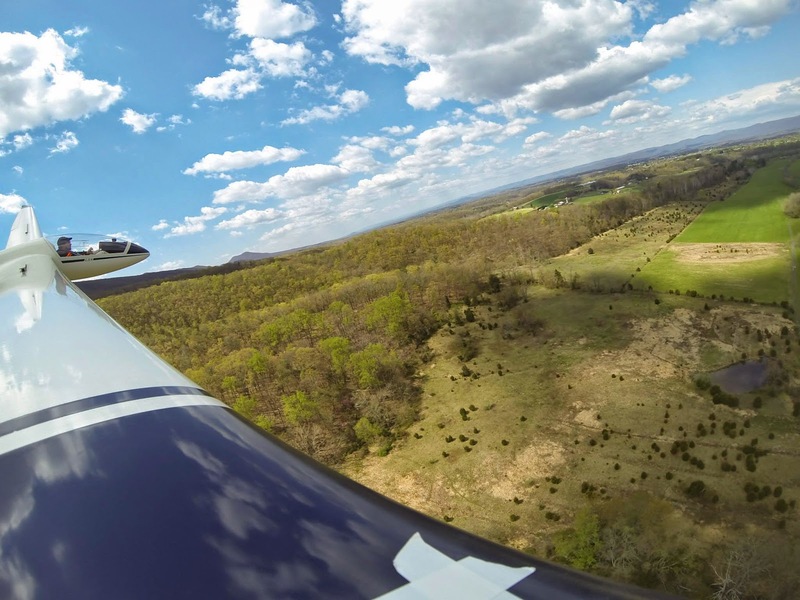 The remaining glider flight operations were suspended due to the high winds and gusty conditions. Everybody headed to our local favorite restaurant to lie about their day's flying. And they all told me about what stories they imagined about me being in the back of a police cruiser after my land-out. I fly. I have to be in the minority, though. I fly, but don't fly planes with engines. I run. I have to be in the minority, though. I'm one of those 1 in 10,000 runners who does the majority of his miles on the road with no shoes on. Yes, barefoot. Weird, huh? Don't worry, I'm used to weird looks. I bike. For this too, I must be in the minority. I'm one of those 1 in 10,000 bikers who doesn't ride what would traditionally be called a bicycle; except that it has two wheels and a handlebar. I just have to be special, don't I? I recently purchased a non-traditional bicycle to use as a cross-trainer for my running program. Those who have ever been in a gym and seen the "elliptical machines" are familiar with the movement. This contraption is such an elliptical trainer converted into a bicycle. Combining the movement of an elliptical trainer and the propulsion of a bicycle, we find this odd vehicle, the "ElliptiGo"
I use the ElliptiGo to commute to and from work, while getting some exercise and avoiding the aggravation of driving during the peak rush hour periods. The ElliptiGo was designed for former runners who still prefer the running motion, but don't like the jarring or impact of running. It's also used by some runners to act as a cross-trainer, to add in miles while doing something slightly different. In fact, the guy who just won the Boston Marathon uses one of these contraptions for cross-training. It's quite a lot of fun to ride, and doesn't hurt my sitting muscles like bicycles do. It definitely turns heads and makes people stop in their tracks, trying to figure out what this weird thing is. More expensive than other low-end bikes, but still not as expensive as the highest-end bicycles. Because of large wind profile, the flat-out speed is limited by profile drag. It's very large and hard to fit onto a standard bike rack. I can imagine that a few types of accidents can wreck the ElliptiGo and make it unusable -- specifically, if the tracks where the front of the pedals roll up and down get damaged from hitting a curb, it might become permanently unusable. No place to store your saddlebags, that I can see, at least. Last fall, I bought a GoPro Hero 3 from a co-worker. I didn't have the chance to make any use of it until this weekend, when I attached it to my glider's wingtip with the Go Pro suction cup attachment. The suction cup is rated to 250 mph (much faster than my glider can fly). I wasn't so concerned about the velocity as I was about the altitude. 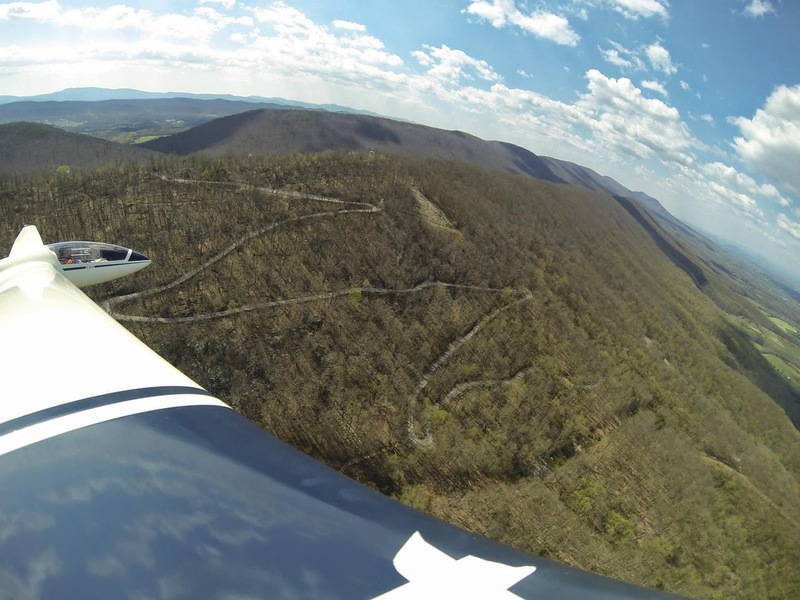 On my flight, I got the glider up to 100 knots along the ridge tops of the Massanutten mountains, near Woodstock, VA. I flew south of Route 211, and headed west toward New Market. There, I connected with wave lift, and climbed above the clouds, topping out at 12,000 feet. It was the high altitude I was more concerned about than the high speed -- suction cups lose their effectiveness when the ambient air pressure is significantly reduced. How much effectiveness is the suction cup reduced? I don't know. GoPro doesn't have any statistics on how well the suction cups work at high altitudes (or colder temperatures!). All of the flying club members (the peanut gallery) kibitzed "You trust that suction cup? I'd tape the heck out of it, if it was mine." "Don't you want to put some sort of lanyard on it?" I put two pieces of wing tape on the leading edge of the suction cup, but decided that a lanyard would be more risk than I could afford. Losing a camera off the wingtip, having a random farmer below find an unexpected gift from above -- that doesn't seem so bad. I think it would be far more favorable than having the GoPro flap around and banging on my wingtip, leaving very expensive dents in the fiberglass. In any event, flying fast on the ridge would have made an excellent video. The GoPro would also have made excellent video while flying above the clouds in the smoothest air you could possibly imagine, while climbing at 700 feet per minute. 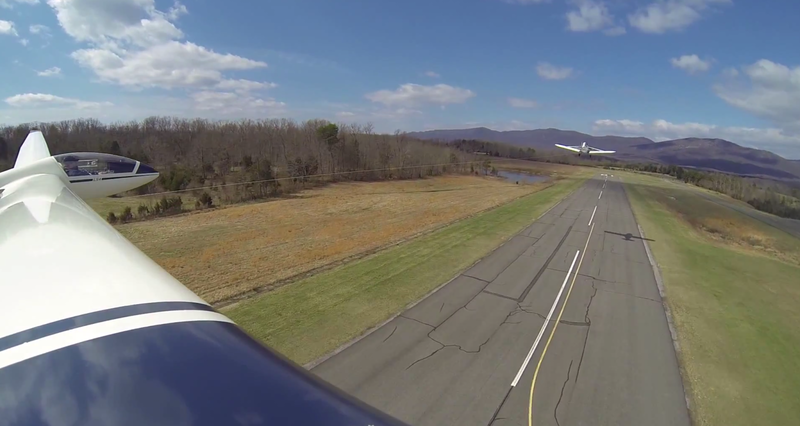 (A smoother flight than if you were sitting in the cockpit while the glider is in the hangar). All of that would have been nice to see from the Go Pro camera, but the battery on the camera gave out shortly after takeoff. While setting up for the initial recording of video, my iPhone app showed a red bar for the GoPro's battery capacity. I managed to only get 11 minutes of video.